The geomagnetic field effect on charged particles in inclined extensive showers is interesting both for complete use of observational data in analysis – it would enhance the utilized aperture of air shower array, and to derive the enhanced information on EAS development in atmosphere, concerning the high energy muonic component, mainly. These showers should differ from vertical one by the reduced electron-to-muon ratio because their electromagnetic component is strongly absorbed by the greatly enhanced atmospheric slant depth, and by the pronounced asymmetry in lateral distribution of muons due to divergence of charged particles in the Earth’s magnetic field. The analysis of inclined showers produced by the primary protons, nuclei, photons or neutrinos requires a radically different approach.The data provided by these events are difficult to analyse because the conventional methods used for interpretation of low zenith angle showers are usually based on the approximate circular symmetry of the density distribution. An example of the very inclined shower detected with the Yakutsk array is given. Upper part shows the particle density as a function of distance to x and y axes in the chosen bands. In the part below the particle number densities in a plane perpendicular to shower axis are given. Oval lines are equidensity level curves. Vector above x axis is a projection of the Lorentz force vector. The ovality of muon density patterns arises because of the different muon paths from the production point to ground level. The cumulative effects of all muon interactions (such as magnetic deflections and continuous energy loss) and decays depend mainly on the Lorentz force. It can be parameterized by a ‘geomagnetic factor’ in a particular event, g=sinξsec2q, where ξ is angle between shower axis and field vector. 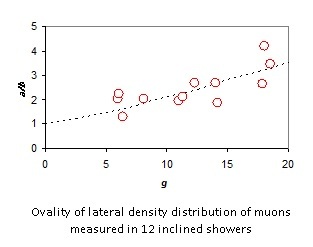 Muon density distribution ovality can be measured as the ratio <a/b> at equal density, where a and b are projections of the shower core distance on axes along and perpendicular to ξ. The ovality measured in 12 very inclined EAS (from q=670 to 780) with energies above 10 EeV, i.e. a/b ratio as a function of the geomagnetic factor of showers reveals the pronounced effect beyond the bounds of statistical errors and in agreement with model prediction (dashed curve). 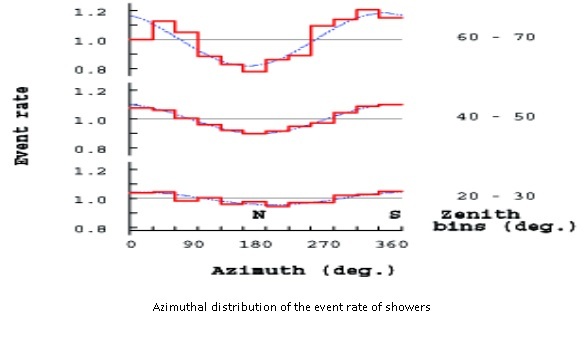 Another effect can be detected in showers with fixed zenith angle and r600 – the particle density at r=600 m from the core: one can measure the azimuthal modulation of EAS event rate due to the muon density lateral distribution asymmetry depending on c. Indeed, the observational data of the Yakutsk array have revealed the geomagnetic effect on the reliable statistical basis. Figure shows the distribution of the relative number of EAS events above 0.05 EeV measured with the Yakutsk array in the period 1974-1995, zenith angles in the bins 20o-30o, 40o-50o, 60o-70o. The function 1+A1 ´ cos(a –a1) is shown by dashed lines. 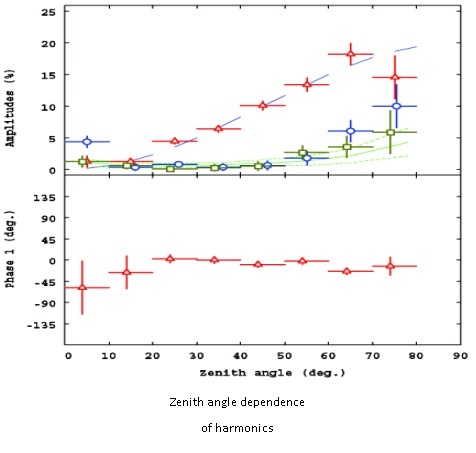 In Figure on the right the amplitude (upper panel) and phase (lower panel, 1st harmonic) of the first three harmonics of the distribution versus zenith angle are shown The second and third harmonics amplitudes come up to the expected value for the uniform distribution of azimuths shown by a dashed line for the measured number of showers in each interval. Dotted lines show the r.m.s. deviations from the expected amplitudes. The first harmonics amplitude (triangles) essentially differs from zero at zenith angles larger than 200. In this region one can discard the uniform distribution with the chance probability below 10-14 basing on the probability for the uniform distribution to have the first harmonic amplitude A1: P(>A1)= exp(-n´A12/4). The approximation 0.2´sin2q is shown by the dash-and-dot line. The first harmonic phase coincides with the magnetic meridian in Yakutsk. For showers arriving from the north observed particle densities in detectors are higher than in “southern” showers of the equal r600 with equal zenith angle. When we select showers with the same observed densities r600, the real primary energy of showers arriving from the north is less. It results in a decrease in corresponding event rate, because the number of showers at the array diminishes as the energy decreases in the region 0.01<E<0.1 EeV. The amplitude of the first harmonic is defined by a relative value of density change measured for the southern and northern showers. The inclined showers ought to be analyzed taking into account a geomagnetic effect on the lateral distribution of charged particles. A common algorithm based on the axially symmetric function, for instance, results in the primary energy overestimated up to 28%. 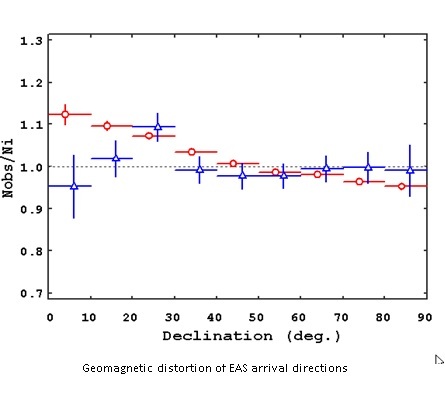 Observed distribution of arrival directions in a horizontal system is distorted due to azimuthal event rate modulation in the geomagnetic field. The right ascension distribution isn’t affected because of diurnal spreading. On the other hand, the declination distribution should be corrected. We have used two distributions in azimuth: the uniform one and the observed spread of the Yakutsk array data in order to simulate the ratio of distorted to isotropic arrival directions. From the experimental dataset zenith and azimuth angles were extracted of showers in the energy ranges above 0.1 and 2 EeV; then the uniform sidereal time distribution was added to convert arrival directions to equatorial and galactic co-ordinates. In the case of isotropic spread a uniform distribution in azimuth was used instead of experimental one. The resultant ratios of observed to isotropic shower numbers as a function of declination and galactic co-ordinates are found. There exists an obvious systematic disfiguration of the initial isotropic distribution of a magnitude up to 10%. We have demonstrated the azimuthal effect on EAS event rate caused by the geomagnetic field using a bulk of the Yakutsk array data above 0.1 EeV. The value of the effect is approximately the same in the whole energy range. The primary energy and arrival directions of showers appear to be modified due to geomagnetic distortion of the EAS particle density with a magnitude up to 10-20%, relative to the case when a field is switched off.